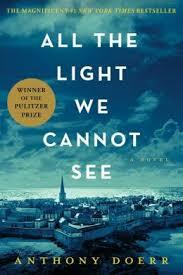 ‘Leaflets,’ the opening chapter of All the Light We Cannot See is two paragraphs long: “At dusk they pour from the sky. They blow across the ramparts, turn cartwheels over rooftops, flutter into the ravines between houses. Entire streets swirl with them, flashing white against the cobblestones. Urgent message to the inhabitants of this town, they say. Depart immediately to open country. Anthony Doerr’s melodious descriptions, juxtaposed with raw detail, give perspective to World War II and the natural world in which war is waged. The story takes place in Germany and France and it delves into the lives of characters who are actively and unwittingly caught in the conflict. The novel begins shortly before Germany invades Paris, then winds its way through the occupation and the war’s aftermath, but the action is not always presented in chronological order. This play with time in no way diminishes the story; rather it is a tribute to Doerr’s skillful writing. Among the cast of characters are some of Hitler’s henchmen seen at their day-to-day tasks. Extermination of the Jews is rarely brought front and center; instead Doerr shows the Nazi’s unleashing their horrors on unlikely victims, often “perfect” Germans; Aryans, who, despite their best intentions, can’t or don’t always match up to Nazi ideals. The book’s two young protagonists are Marie Laure LeBlanc, a blind Parisian girl and Werner Pfennig, an orphaned eleven year-old German prodigy. Werner’s ingenuity with radios and electricity helps him avoid work in the coal mines, but earns him a spot in a Hitler Youth School. It is mostly through these youngster’s that Doerr works wonders with his “light” motif. Using Marie’s blindness, her intelligence and love of nature and Werner’s skill with electrical circuitry, he presents the metaphorical and physical possibilities of ocean life and sound, and especially light, in ways that a person cannot see, or perhaps chooses not to see. Eventually Marie and Werner cross paths in scenes filled with all the beauty and heartbreak that is so skillfully rendered throughout this stunning novel.